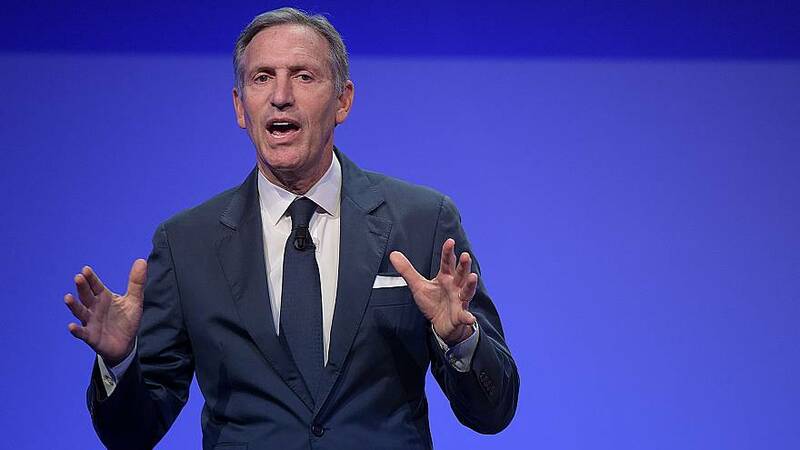 Billionaire businessman Howard Schultz, who said he is "seriously" considering an independent 2020 presidential bid, was shouted down by a protester at the kickoff event for his nationwide book tour on Monday night in New York City. "Don't help elect Trump you egotistical billionaire a-----e," the protester shouted at the former Starbucks CEO, who is worth more than $3 billion according to Forbes. "Go back to getting ratioed on Twitter," the protester added, pointing to Schultz's tweets that were garnering substantially more comments than retweets or likes, a sign of disagreement with his message on the platform. "Go back to Davos with the other Billionaire elite who think they know how to run the world." Schultz was speaking with CNBC's Andrew Ross Sorkin at the Union Square Barnes and Noble when he was interrupted by the protester. He told Sorkin that he was not surprised by the criticism after announcing his possible run. "I'm not running a primary race on Twitter" he said. In a "60 Minutes" interview that aired Sunday, Schultz said he would run as an independent instead of as a Democrat because "we see extremes on both sides." Schultz toldThe New York Times he planned to tour the country for the next three months promoting his new book before deciding whether to ultimately run. In an NPR interview, Schultz said it "would kill me to see" Trump re-elected, which he believes would happen if a progressive won the Democratic Party's nomination. Democrats were apoplectic about Schultz's proposed independent bid, saying all it would do was improve chances for Trump to win re-election. Former New York City mayor and fellow billionaire businessman Michael Bloomberg, who is considering a Democratic presidential bid of his own and has flirted with independent runs in the past, offered strong criticism on Monday. "Given the strong pull of partisanship and the realities of the electoral college system, there is no way an independent can win," Bloomberg said in a statement. "That is truer today than ever before." Trump joined in on the fracas, tweeting that Schultz didn't have the "guts" to run for president. The New York Times reported that Trump, at a Monday night fundraiser, said he wants Schultz to run because he thinks such a bid would help his re-election efforts.